Yvonne And Her Playground Singapore Beauty and Lifestyle Blog: Review: Laneige Water Bank Series, Revitalised! 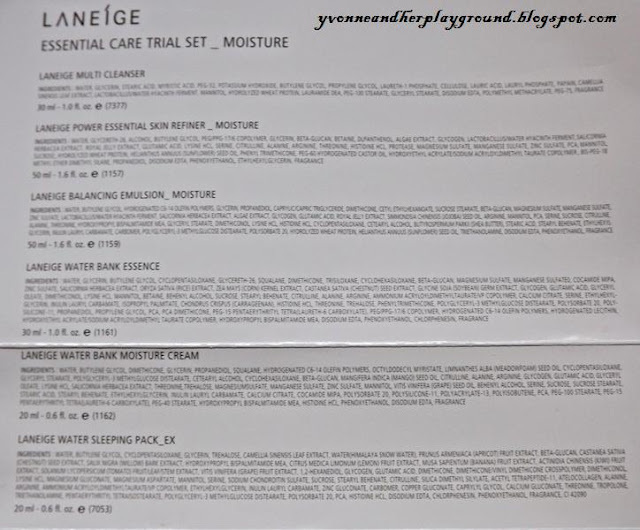 Review: Laneige Water Bank Series, Revitalised! Does your skin feel dry? Or do you even feel that your moisturiser isn't able to provide your skin with long lasting hydration? You don't have to feel troubled now! Because of Laneige latest break through, the new Water Bank Range which boasts greater hydration prowess – from the initial 12 hours to 24 hours! Isn't it fantastic? But the best thing is how these products help to infuse moisture deep into the skin layers and increase moisture circulation within skin cells – the key to the new Water Bank’s success. I really love the idea of getting hydrated skin all day long especially when I have dry skin and my skin becomes very tight after a few hours in an air-conditioned room. However, other than being able to provide longer hours of hydration to my skin, the other key concern of mine is that the products must not cause breakouts on my skin. 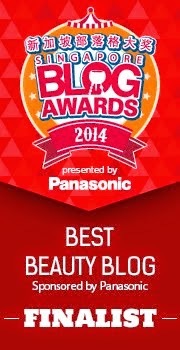 Breakouts are terribly difficult to heal on my skin, so I have learnt to be more careful in using the right products. So far, I have been using this Laneige Water Bank Range close to a month, every day and night, and I am ready to give my honest opinions about this new range. Here's the ingredients list for the products. You may want to click on the image to get a better view. 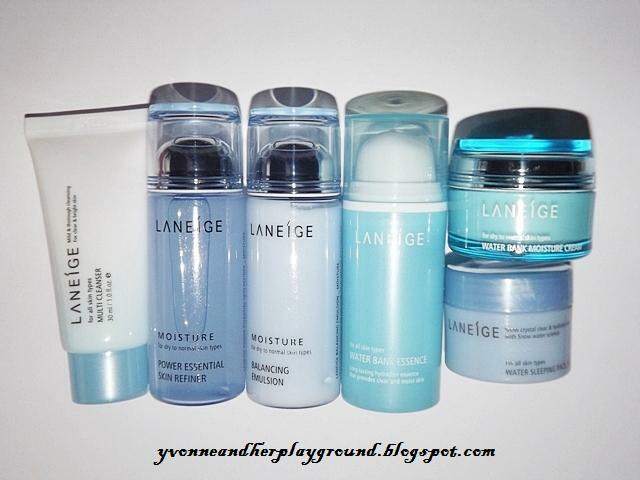 Here are the colours and textures of the different Laneige products. 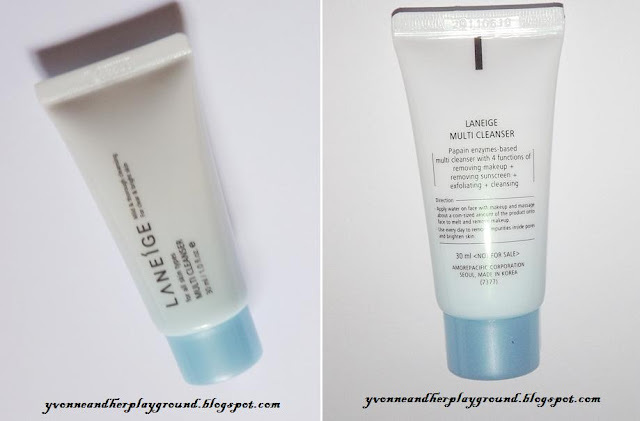 I will be reviewing the products in their order of use, so the first product is the Laneige Multi Cleanser. In terms of removing makeup, yes it did works but it wasn't able to thoroughly remove waterproof makeup. In terms of removing sunscreen, yes it did works on normal sunscreen but I'm not sure about waterproof ones. In terms of exfoliating, the exfoliating effect is minimal as there's just too little microbeads in the cleanser and the microbeads are ultra tiny. I think that's why this cleanser is suitable for daily use. In terms of cleansing, it did a great job in removing all the dirt and grease from my face, leaving my face clean and smooth but not tight at all. This cleanser foams up easily, giving thick foam. The foam texture is very much like Neutrogena Deep Cleansing Foamy Wash. After rinsing off the foam, my skin did not feel tight or dry. Instead, it gave me the smooth skin texture just like how I've experienced with the Biore Marshmallow Whip Facial Wash. This Laneige cleanser comes with the same soothing scent as the other products in this Laneige Water Bank range which makes me feel calm every time I use it. The second product I'm reviewing is the Laneige Power Essential Skin Refiner. 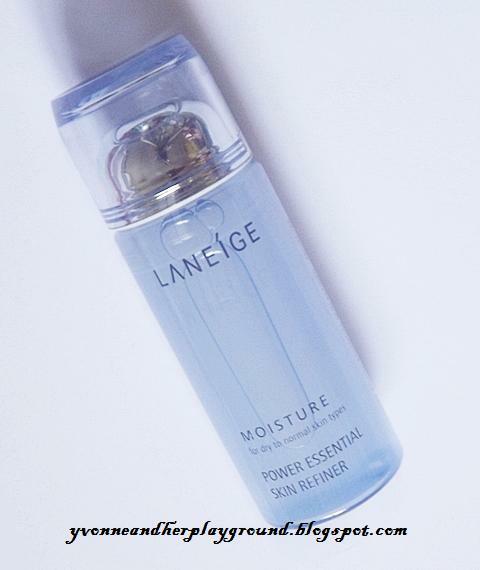 Laneige Skin Refiner works like a skin softener or you can even call it a toner. This product helps to remove the dead skin cells from your face when you sweep across your skin with a cotton wipe. This skin refiner gets absorbed into the skin easily. You can also do gentle tapping or massage your skin in circular motions for a much faster absorption. You can feel your skin slightly hydrated after using it. I tell you, I really love this skin refiner loads and I like to apply a lot of it when I use this because it doesn't clog pores and it does not result in any sticky or greasy feeling. This is one of my favourite toners so far. 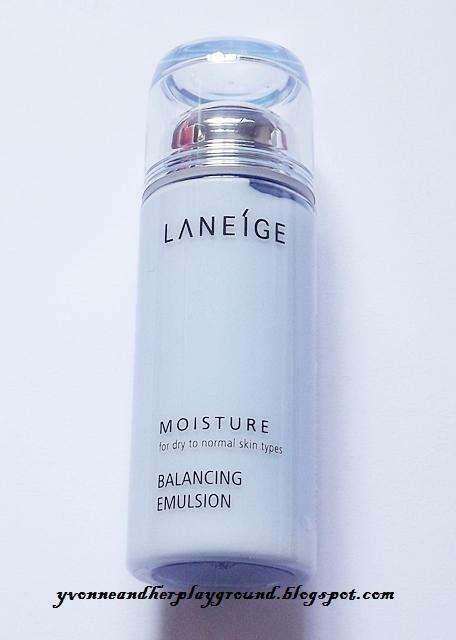 The third item I'm reviewing is the Laneige Balancing Emulsion. The thing that disturbs me when I first use it is the design of this bottle because it is just so difficult to dispense the lotion out from the bottle. I have to shake the bottle with the opening facing down and knock the opening against my palm to get the lotion out and very frequently, I get the lotion 'flying' everywhere. Anyways, about this product, I like it too! It's because this lotion feels light-weighted and the lotion comes in a slight watery texture which is not thick and heavy at all. It absorbs well into my skin and did not result in any greasiness, and you can apply a lot of it without worrying that it will clog pores. However, if you are thinking that this is the final product and it is already sufficient for your skin, I would say a huge NO! I did the same mistake and after hours in an air-conditioned room, I can feel my skin starting to feel tight again. That's because this emulsion isn't able to lock in moisture in your skin for long hours. 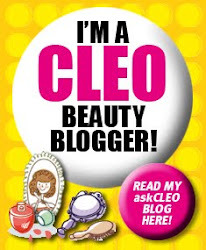 Hence, I am going to share my reviews for the other 2 products which you can use in the day. 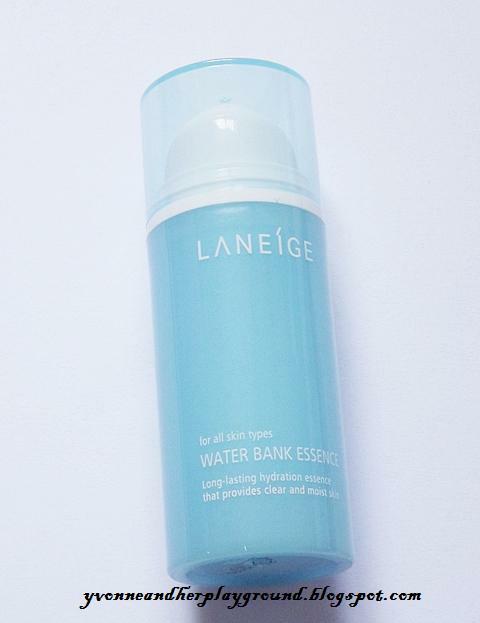 Next, I am sharing my review for the Laneige Water Bank Essence. 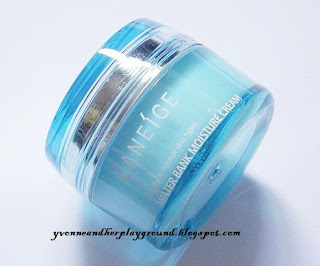 Next, I am sharing my review for the Laneige Water Bank Moisture Cream. Frankly speaking, I don't really like this cream initially because it feels thicker than the Laneige Water Bank Essence (you can see from the photo which I shared the textures of the different Laneige products, this product is the creamiest). This product is not only creamy in texture, it is sticky too. If you are frequently in humid and warm area, you will find your face feeling sticky but if you are in an air-conditioned room most of the time and for long hours, you will love this product because this product coats your skin with a protective barrier and you won't ever feel your skin being dry or tight at all. This product is the most important to supply ample moisture and safeguard it from drying up so that your skin can feel hydration for long hours. I apply a thin layer of this on my skin every morning and it works really good. 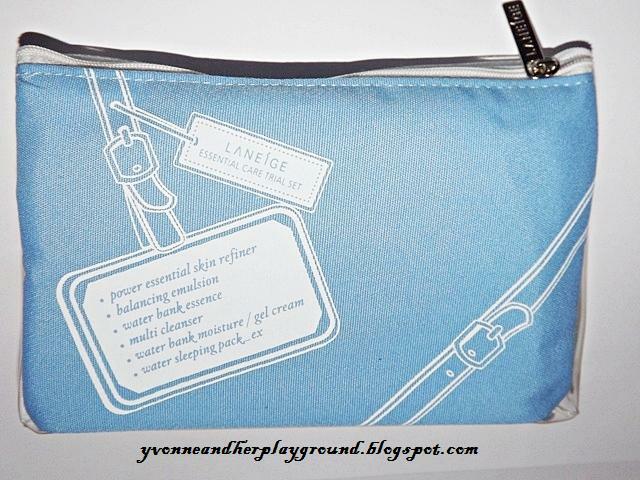 Now, the last product that I am reviewing is the Laneige Water Sleeping Pack_Ex. 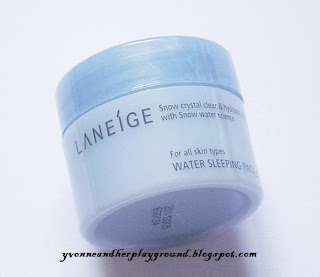 I am sure many people are familiar with Laneige Water Sleeping Pack_Ex, right? Laneige Water Sleeping Pack_Ex is the most famous Laneige product for nourishing the skin even while you are sleeping! At night, the skin's defense system weakens, and osmosis is enhanced, increasing the skin's permeability and absorbency. From 10 p.m to 3 a.m, the skin is most active for regeneration hence it is the best time to nourish your skin. You can just apply Laneige Water Sleeping Pack_Ex and go to sleep. You don't have to rinse off at all. It is just so convenient! :) My skin feels so much smoother every morning. I like it! I think Laneige products are worth investing in as a well hydrated, nourished skin keeps troubles (flaking of skin, fine lines, wrinkles etc.) at bay. Furthermore, the products can last for quite a long period except for my cleanser and skin refiner which I have finished using. Disclaimer: I am not affiliated to Laneige, Singapore. The products were sent to me to try. Reviews published here are honest and based on my own experiences. I am not getting paid for sharing my reviews. 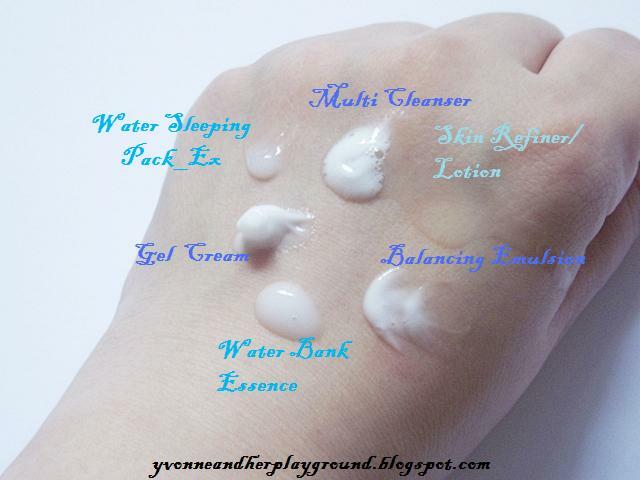 How much is the water bank moisture cream? How much is the moisture cream? Hi Lily, the Laneige water bank moisture cream cost S$52. Hi Anon, laneige is suitable for men too. This range is good for people with dry to normal skin types as it helps to boost the water hydration of the skin. hi, may i know how did you get this trial pack? how may i buy/get this trail pack? are there other laneige series trial packs? Hi lee liet, the trial pack can be purchased over Laneige counters when they hold their promo sale a few times yearly. You can look out for their promo sale in the local newspapers or at Laneige's facebook page. sis, how much 1set water bank series??? sis, how much 1 set water bank series ???? Hi Grace, Laneige sells the items separately and not exactly in a set, hence I would advise you to check out the pricing of the items you want over their counters. Laneige has various promotion periods throughout the year which gives you discounts or freebies when you purchase certain items, so it's best you check with Laneige. something like that. Can I implement a portion of your post to my website? I think this website has very good composed articles posts. Hi GO, I think it depends on your skin type and the environment that you are in. If I am in a dry place, I really love using Laneige waterbank series, but for normal environment conditions, I do like Dr G's aquasis. on this subject last couple of days. blogs We've ever arrive across on this subject. Actually Excellent. impressed! Very useful info specially the last part :) I care for such info much. Good web site you have here.. It?s difficult to find good quality writing like yours nowadays. is simply cool and i could assume you're an expert on this subject. I don't even understand how I ended up here, but I believed this submit used to be great.